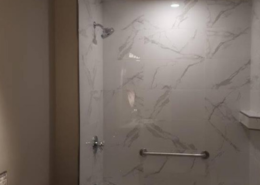 Whether you’re undergoing a small bathroom renovation or a complete bathroom remodel, a new bathroom can add elegance, sophistication, and functionality to your home. Are you inspired by a dream of having a stylish bathroom that will be the envy of all those who visit your home? Let All-Craft Renovations help turn your vision into reality! We are confident in our custom bathroom designs, knowledge of trends, and our high standards in craftsmanship. The bathroom is without a doubt one of the most important rooms in a house, and a main piece of the puzzle when considering home renovations. Many home buyers decide whether they want to buy a home or not depending on their satisfaction with the bathroom, kitchen and size of bedrooms. Although it is one of the smaller rooms of a home, it is one of the most frequently visited. Ensuring your bathroom is functioning properly and designed with detail is very important. If you currently own a home, there are benefits associated with a detailed bathroom renovation. Looking for a little personality or character in your home’s bathroom? It is amazing how a simple remodel of one, or multiple, bathrooms can increase the market value of the entire home. It can also add a whole new feel to the house, especially if the ensuite bathroom attached to the master bedroom is renovated. 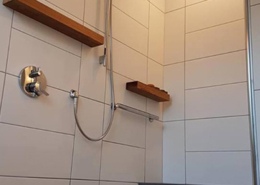 Selling a home will become easier with a renovated bathroom as a focal point, as many buyers who get connected to the way a main bathroom looks and feels end up buying the home. Many older homes were outfitted with proportionally small bathrooms, especially in the main suite. A bathroom renovation gives you an opportunity to turn a small bathroom into the spacious dream room you always wanted! Do you have limited space to expand? Let us show you how adding a few inches to the shower, or counter tops, makes a massive difference. If you are the kind of person who loves being in a spacious bathroom, remodeling or renovating will definitely be a reward. Is your bathroom showing its age? It is very likely that plumbing problems are an issue or could become an issue soon. Rather than waiting for plumbing issues to occur, you can choose to renovate your bathroom now and outfit it with new and better-quality piping and fittings. A bathroom remodel or renovation would also be a great time to look into efficient faucets, toilets, and shower-heads. Compared with older materials, new efficiency saving updates will keep money in your pocket instead of going to your water bill. With the bathroom being such a heavily used room, it is easy for it to lose its appeal quickly. As much as you scrub and clean the floor and the walls, the nature of what goes on in the bathroom, plus constant humidity, leads to damage, and wear and tear. Repainting the bathroom can be a simplistic solution when everything else is already getting renovated. In addition, you have endless options of stylish trends to outfit your bathroom with, such as a backlit mirror or an oversize custom shower. As your bathroom renovators, All-Craft will make your bathroom so appealing you’ll never want to leave. A powder room for guests adds elegance to entertaining. We are experts at identifying unused space, or effectively borrowing space from adjoining rooms. A complete bathroom addition attached to your guest room allows you to offer your overnight guests comfort and sophistication. A realtor will often say, “You can’t afford not to.” Adding a bathroom addition or transforming existing bathrooms can bring a 70% return on investment should you sell your home. Your own comfort is priceless, and the return on investment is daily while you relax, renew, and recharge in your new custom bathroom. All-Craft is with you from bathroom design to build. We will be sure to deliver the best quality and features possible for your budget. Our experience gives us the ability to set costs and stick to them. Our network of quality sub-contractors and suppliers enable us to stay on budget. Our budget estimates are honest and realistic from the very start of the bathroom renovation process. How can we provide no-hassle bathroom renovations? Putting it simply, All-Craft’s bathroom contractor team has a lot of practice at eliminating any hassle from bathroom remodeling. We offer extensive experience in doing what it takes to create the ultimate bathroom for you, and your home. Our knowledge base enables us to honestly relay to you the phases of the project and what you can expect next. 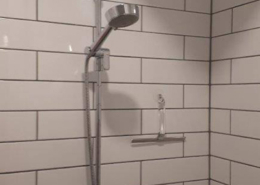 As a bathroom renovator, there is no excuse for delay or budget busting due to poor planning. When working with All-Craft, you will get an honest plan and honest updates as we always keep your family and home in our greatest interest. 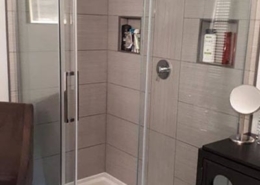 If you are looking to add a basement bathroom in Halifax, please check out our basement renovations page. 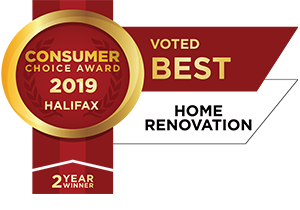 If you are looking to schedule a quote for a bathroom renovation in Halifax, please contact us today!